This article reviews the extent of blood loss in spine surgery for scoliosis corrections in the pediatric age group. An extensive literature review presents blood loss values in surgery for adolescent idiopathic scoliosis, cerebral palsy, Duchenne muscular dystrophy, spinal muscular atrophy, and myelomeningocoele. The underlying disorder plays a major role in determining the extent of blood loss. Blood loss is considerably higher in those patients with a neuromuscular scoliosis compared with adolescent idiopathic scoliosis. Within the neuromuscular group those with Duchenne muscular dystrophy demonstrate the highest mean levels of blood loss. 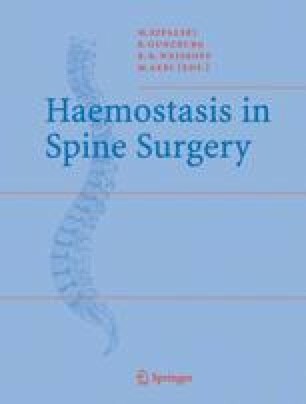 Blood loss is also shown to be progressively greater with increasing numbers of vertebral levels incorporated into the fusion, with posterior fusions compared to anterior fusions, and in those patients having both anterior and posterior fusions.